Skills and abilities: Skilled designer. Powers: Nicolena dons a prototype costume called a TUX (Tricot Ultralight Exoskeleton) which enables flight. It was also said she wears a G.E.A.R (general Energy Abating Rags) suit that absorbs and redistributes energy. She also has access to a G.E.A.R (general Energy Abating Rags) suit. 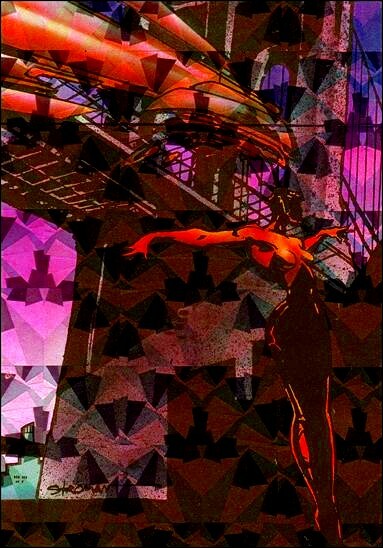 If Tribe had remained at Image she would have made her debut in Tribe #5 at a fashion show where Savage Dragon, father of Malcolm Dragon and Youngblood made an appearance [Tribe collectible card Promo set, 1993]. I haven’t forgotten .This character was part of a great series. Such a pity Tribe just drifted into obscurity the way it did….